You've never looked better than in our Aaliyah Black Stole with Swarovski Crystals and Fox Fur Trim for women. This charming design features a pristine black cape with an excellent fox fur trim for a regal look. Sparkling Swarovski crystals create an impeccable webbed style over the entire accessory. A velvet soft lining is enhanced with a silky interior. 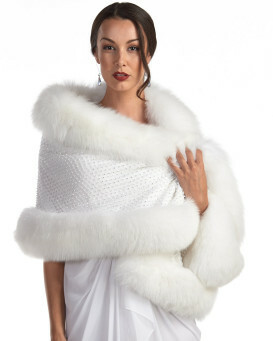 One hook and eye closure allows you to wear this stole any way your want. This formal design looks divine over a little white dress. Don this scarf to enhance your ensemble at a fancy winter gala or romantic date out.